A contemporary adaptation of German playwright George Kaiser’s 1945 play ‘The Raft of the Medusa, ‘Life Raft’ adeptly captures the bleakness of its source material’s story of thirteen children stranded at sea at a time of war. 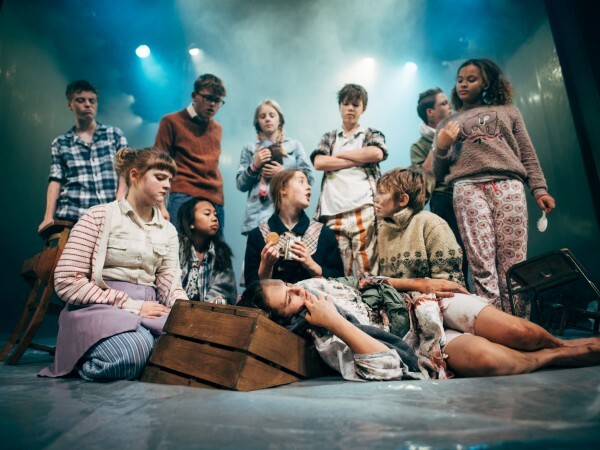 Written by Fin Kennedy, directed by Melly Still and featuring a talented cast of unprofessional child actors aged 11-17 years old, the play is an often tenebrous tale of survival in its touching on such themes as loss of childhood, the difficulties of pure democracy and superstition. The play begins in a unique and unexpected fashion – an unanticipated crash of thunder and flashing light – as the actors emerge from all directions of the Old Vic theatre; distressed and panicked they move amongst the audience before making their way to the stage. We learn that the twelve children are adrift at sea on a lifeboat, their passenger liner sunk by an unknown enemy during an unspecified war that has been going on for as long as they can remember. After an initial mismanagement of their ration box, and the discovery of mysterious, “unlucky” thirteenth member called Foxy, it’s discovered that there are likely only enough supplies for 1 ¼ biscuits and 150ml of water for each person per day. ‘Life Raft’ deals with the power struggles within the group and how best to manage their supplies as they agonisingly await their rescue. The group of castaways includes Alan and Anne who, as the two eldest aboard, impose themselves as self-appointed leaders of the group, hot-headed Alfie who is armed with a slingshot, compassionate but confrontational George, stuttering Archie and the caring Anthea who watches over the deeply wounded Amy. Understanding the importance of togetherness that their plight has imposed, there is initial harmony amongst the group; each introduces themselves as they take a sip of milk and, as the most vulnerable member of the group, injured Amy is catered for first. Even the completely mute Foxy, who is later cast by most as a pariah, is offered several items of clothing after it is found that he has wet himself. This soon changes as time passes and supplies start to run low. Members of the group start to view Amy’s injured state as an irritating burden and Foxy’s continual non-interaction makes him dispensable in the eyes of most. Even the initially well-meaning Alan and Anne make a sharp change of leaning towards self-preservation as their situation becomes more desperate; in possibly the play’s most intense scene, Alan calls a conference where each member of the group has to give two reasons for their value to the group and nominate the one person who can be dispensed with. This leads to a “have and have nots” dividing line aboard the lifeboat and the initial importance of togetherness appears long forgotten. 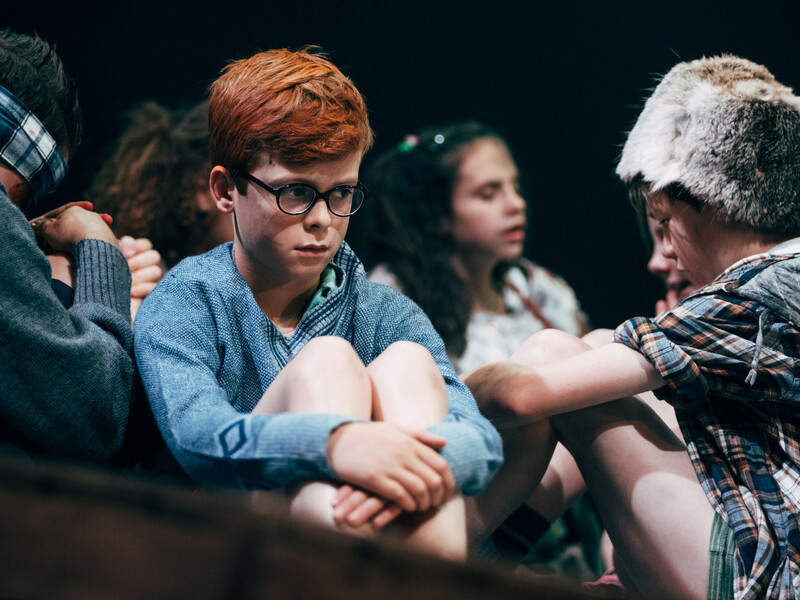 The struggle of the children in ‘Life Raft’ is representative of many themes: the apparent childhood default setting of benign innocence is corrupted through intense struggle and their behaviour implicates the unseen adults who have created the play’s backdrop of war-torn dystopia. Alan and Anne’s self-appointed leadership throws a wrench in the assertion that elders always know best and the unspeaking and brightly ginger haired Foxy can be seen as comment on both fear of the outsider and the importance of voicing one’s opinion when given democratic opportunity. The treatment of Amy speaks of the importance of looking after those most vulnerable and how the foundations of a compassionate outlook can be shaken when an individual’s personal situation comes under threat. ‘Life Raft’ excels in the brilliant performances of its fledgling cast and, with the moody atmosphere of its soundtrack, oceanic sound effects and imaginative dream interludes that hint a potential descent into madness, its presentation impressively evokes the bleakness of the children’s plight. Tagged bristol old vic, life raft, review, scott hammond. Bookmark the permalink.